Despite their valiant efforts, the Roadrunners came up just short in their final regular season visit to the Valley View Casino Center Friday night, falling to the San Diego Gulls by a 2-1 score. A lapse in the first period ended up costing the team dearly; Tucson played a rather complete game, outshooting the Gulls by a 40-35 margin. San Diego scored its two goals in a 22-second span midway through the opening frame, the first of which came off the stick of Corey Tropp during a scrum in front of Tucson’s net, the second on the ensuing shift off a Sam Carrick redirect as he was stationed in front of Adin Hill. Hill played a marvelous game, stopping 33 of the 35 shots directed his way. The Roadrunners potted their only goal of the evening when Chris Mueller struck home a Joe Whitney feed on a two-on-one sequence with 1:10 left to play in the middle frame. With the assist on Mueller’s goal, Whitney has now registered an assist in each of his first three games in a Roadrunners uniform. Mueller now has five goals on the season against San Diego. Hill stood strong in the third period, making a whopping 17 saves during the final frame, but the Roadrunners were unable to piece together an equalizer. David Musil, in his first game with the club, registered three shots on goal. 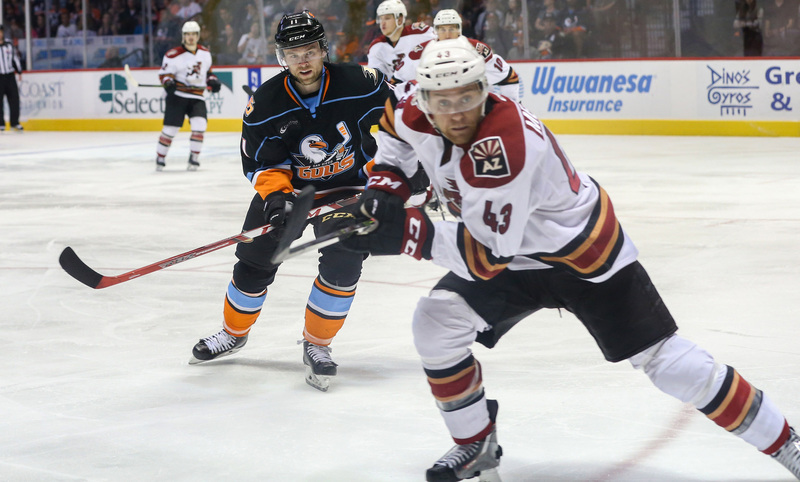 The Roadrunners have now momentarily dropped to sixth-place in the Pacific Division. The Bakersfield Condors, who currently hold the grouping’s fourth and final playoff spot, earned a 3-2 overtime victory over the Ontario Reign. The team will continue and complete their five-game road trip against the Ontario Reign, who they’re scheduled to play Saturday at 7:00 PM MST and Sunday at 3:00 PM MST at Citizens Business Bank Arena. 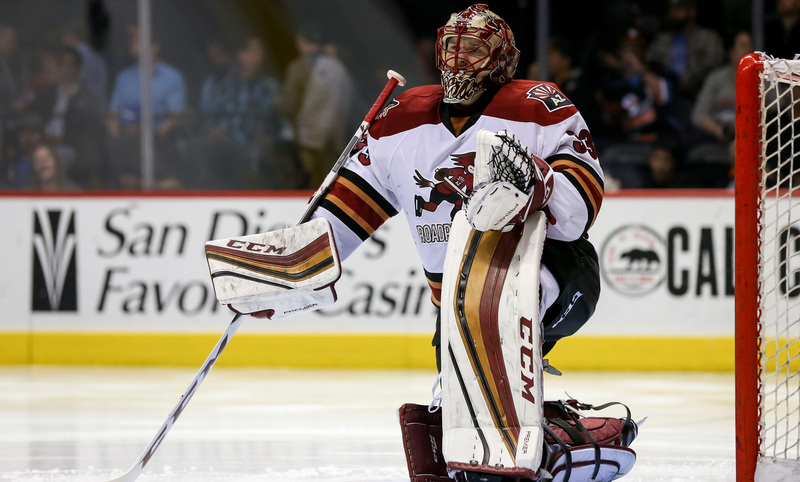 The club returns home to Tucson Arena for a pair of games against the Bakersfield Condors on Friday, March 17 and Saturday March 18. Friday’s game will celebrate St. Patrick’s Day, while Saturday’s contest will feature ‘Cancer Awareness Night’.